The latest technology wire drawing machines are used to produce hard drawn wire suitable for the manufacture of products such as nails, welded mesh, cold heading and welding electrodes. CWI has two sophisticated galvanising lines capable of producing high quality hot dipped galvanised wire using a closed loop computer control system. Zinc coating of between 30 and 488 g/m² can be achieved on diameter between 1.25 and 6.00 mm. Tensile strengths of between 480 MPa and 1500 MPa can be produced. Our wire quality is world renowned and is used for the manufacture of armouring of electric cables, welded mesh, paper pulp baling and the manufacture of various fencing products. 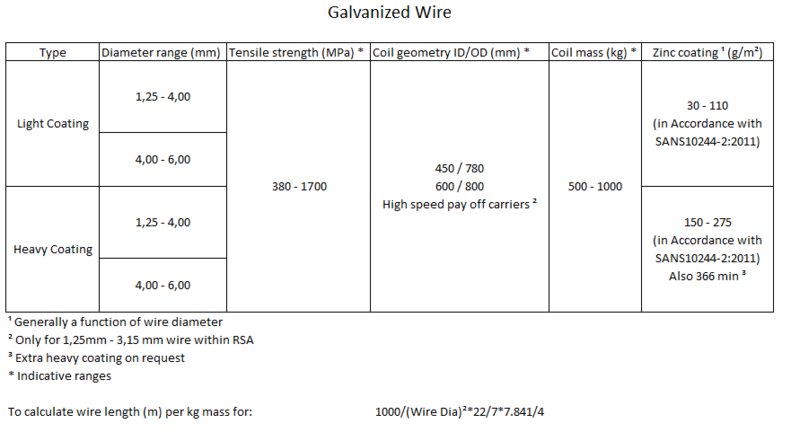 Our galvanised wire is exported to various international destinations.